Kristen has a B.F.A. in Theater Arts from the University of the Arts and has been working in Philly as a professional actor, improviser and teacher for several years. 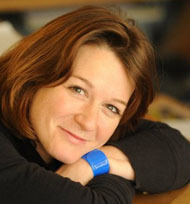 She has worked with Commonwealth Classic Theater Company, Shakespeare in Clark Park, and Ego Po. She has appeared in many productions including the originally created Art of War, which received a Barrymore Nomination for Outstanding Ensemble. Kristen has studied clowning intensively with Giovanni Fusetti and has studied improv at The Second City and at the Annoyance in Chicago and the Magnet Theater in NYC. She has taken workshops and classes with such improv notables as Michael Gelman, Jill Bernard, Armando Diaz, Asaf Ronen, Mick Napier, Susan Messing, Jonathan Pitts Joe Bill and Mark Sutton and members of the UCB Theater in New York City.